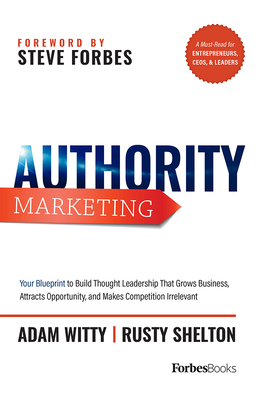 Learn how to use Authority Marketing(R) to build thought leadership and dominate your competition by playing a game no one else knows is being played with this ground-breaking book Are you the Authority in your field? Are you recognized as a stand-out thought leader, a published author, a keynote speaker, or a media personality? Are you viewed as a commodity? A hard-working expert who is a commodity and has to compete on every level, including price? One thing is for certain: Authority doesn't just happen; Authority is built through a systematic process called the Authority Marketing System. But how can you make this shift in an environment that is noisier and more crowded than ever before? If you are an entrepreneur, CEO, or professional who is frustrated with the traditional approach to marketing and wants to grow your business and make a bigger impact, this book will show you how to use the Authority Marketing System to create a clear and trackable blueprint to shift yourself from a commoditized expert to a highly visible Authority. In this book you will learn: - What Authority Marketing is and how to use it to grow your business - The 7 Pillars of Authority Marketing - How others have used Authority Marketing to create unimaginable success - Why thought leadership is your most important secret weapon Authority Marketing isn't about ego or attention--it's about accelerating the speed of trust so you are viewed not as an expert with something to sell, but as a thought leader with important insight to teach. Start growing your Authority today.